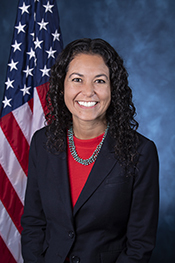 TORRES SMALL, Xochitl, a Representative from New Mexico; born in Portland, Multnomah County, Oreg., November 15, 1984; graduated from Waterford Kamhlaba United World College of Southern Africa, Eswatini (then Swaziland), 2003; B.S.F.S., Georgetown University, Washington, D.C., 2007; J.D., University of New Mexico, Albuquerque, N. Mex., 2015; lawyer, private practice; law clerk, federal district court of N. Mex., 2015-2016; staff, Senator Tom Udall of New Mexico, 2009-2012; elected as a Democrat to the One Hundred Sixteenth Congress (January 3, 2019-present).